Move over Vi and Jag, here comes Raine and Gunner. Same world, same problems, and the Resistance is staying strong. Raine's father is the head honcho of Freedom and Raine and Gunner are oh so valuable to him. Both kids juggle their abilities, their secret role in the Resistance, and their controlled role in a not-so-perfect society. Johnson is a pro at character building and you will fall in love with Raine and Gunner in the same way you love Vi and Jag. Raine is such a strong and resilient girl. She defies her father at every turn and believes that she can have a life outside of the suffocating walls of Freedom. Gunner isn't so sure about...well anything, but he knows he doesn't want to be under the control of anyone. His special abilities, yes that is with an "s", are highly valuable, and Raine, and others, are happy he is part of the Resistance. It only took him a year to be talked into it. The two begin to have googlie eyes for each other and that doesn't sit well with anyone - Raine's father and the both of their matches. 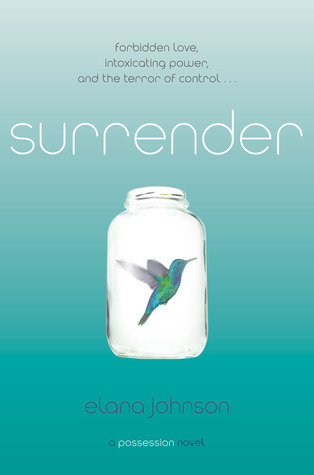 Surrender is packed full of mystery and adventure. There are quite a few characters and they are all connected in way or another. Or even another after that. Everyone has secrets, everyone is hiding something from someone else. It's kind of like Ocean's 11 sci-fi style and has a classic who-done-it feel. We know people are lying and scheming, we just don't know who. The ending will leave you, uh, speechless. This is more than a cliffhanger! 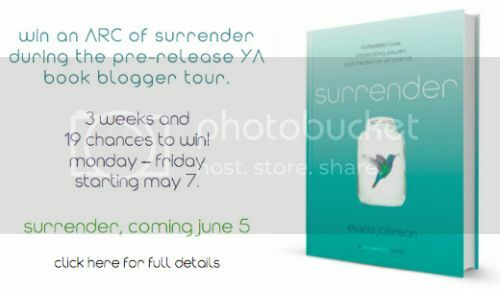 As part of the pre-release tour of awesome, you have the chance to win an ARC of SURRENDER before it releases on June 5th. And not just one chance, SEVEN CHANCES. That’s right! There are SEVEN ARCs available to win this week. Here’s what you can do to win one. Please fill out the Rafflecopter entry widget with what you’ve done. This contest ends at midnight on Friday, May 11, is open in the US and Canada, and winners will be notified over the weekend. Good luck!